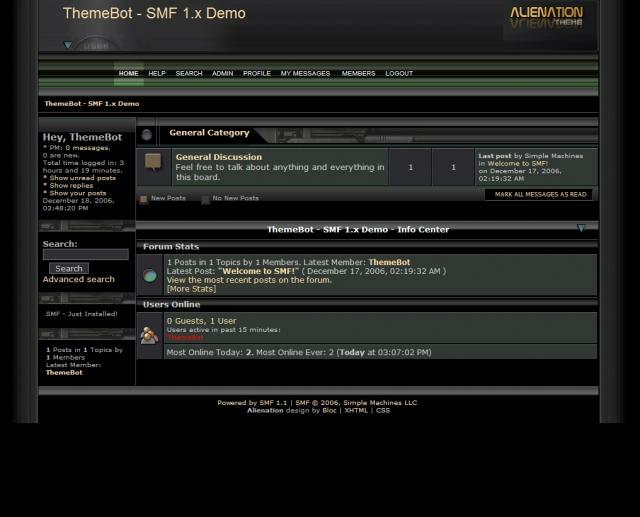 Alienation is a dark theme with some heavyily inspired industrial elements. Complete with custom icons and html fields to insert your own html code. It has a sidepanel with user-details,search and stats + possible to hide away on a per-user-basis. Graphics are free to use within the context of a SMF forum. it's good and great ..i'll give super thnx to Themebot for helpful they are giving . awesome theme, just was i was looking for! but i uninstalled it because i couldnt get rid of the side panel. Thank you for this excellent approach around the topic.